Auerbach was born in Berlin of Jewish parents; his father was a lawyer and his mother a former art student. In 1939 he was sent to England to escape Nazism. His parents, who remained behind, died in concentration camps. He spent his childhood at a progressive boarding school, Bunce Court, at Lenham near Faversham, Kent, a school for Jewish refugee children. During the war years the school was evacuated to Shropshire. He attended St Martin's School of Art, London, from 1948 to 1952, and studied with David Bomberg in night classes at Borough Polytechnic. It was during this period that he developed a friendship with fellow student Leon Kossoff. Auerbach studied at the Royal College of Art from 1952 to 1955. He has used three principal models throughout his career: his wife Julia, who first posed for him in 1959; Juliet Yardley Mills ('J.Y.M. '), a professional model whom he met in 1957; and his close friend Estella (Stella) West ('E.O.W. '), the model for most of his nudes and female heads prior to 1973. Rarely leaving Britain, he lives and works in London and has had the same studio since the 1950s. 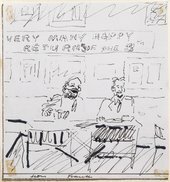 The dealer Helen Lessore at the Beaux-Arts Gallery, London, gave Auerbach his first solo show in 1956. 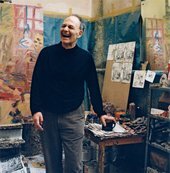 He was criticised for his thick application of paint, but found support from the critic David Sylvester, who wrote of 'the most exciting and impressive first one-man show by an English painter since Francis Bacon in 1949'. Sylvester countered remarks by various critics that the artist's work was closer to sculpture than to painting: 'in spite of the heaped-up paint, these are painterly images, not sculptural ones, have to be read as paintings, not as polychrome reliefs, and make their point just because their physical structure is virtually that of sculpture but their psychological impact is that of painting' (Sylvester, 'Young English Painting', The Listener, 12 January 1956). Kossoff later echoed these sentiments: 'in spite of the excessive piling on of paint, the effect of these works on the mind is of images recovered and reconceived in the barest and most particular light, the same light that seems to glow through the late, great, thin Turners ... an unpremeditated manifestation arising from the constant application of true draughtsmanship' (in Frank Auerbach, exhibition catalogue, Arts Council, Hayward Gallery, London 1978, p.9). Auerbach exhibited regularly at the Beaux-Arts Gallery until 1963. From 1965 he exhibited at the Marlborough Gallery. He was given an Arts Council retrospective at the Hayward Gallery, London in 1978, and had solo exhibitions at the British Pavilion in the 1986 Venice Biennale, and at the Rijksmuseum Vincent Van Gogh, Amsterdam, 1989. Group shows in which he has participated include Tooth and Sons, London, in 1958, Pittsburgh International Exhibition at the Carnegie Institute in 1958 and 1961, '54/64 Painting and Sculpture of a Decade at the Tate Gallery, 1964, British Painting in the Sixties organised by the Contemporary Arts Society in 1964, and The Human Clay, selected by R.B. Kitaj, held at the Hayward, 1976. Frank Helmut Auerbach (born 29 April 1931) is a German-British painter. Born in Germany, he has been a naturalised British citizen since 1947. Frank Auerbach Head of E.O.W.